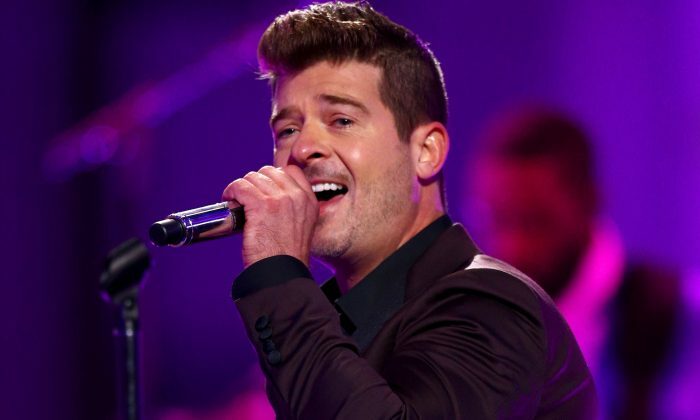 Singer-songwriter Robin Thicke is still reacquainting with his faith after the sudden death of his famous dad, the actor Alan Thicke. The Growing Pains actor collapsed in December 2016 during a game of ice hockey with his youngest son, Carter. He was rushed to hospital but died of a heart attack, aged just 69. Heartbroken, Robin retreated to relative privacy to hurt and to heal. “My father passed away a couple of years ago,” Robin shared, in conversation with People. “It was something I wasn’t expecting and it just rattled my soul.” The 42-year-old was in the middle of penning his first new single in years, “Testify.” His father’s passing was a game changer. “These songs started pouring out that had more meaning and more weight to them,” Robin said. Robin has long kept his personal beliefs somewhat close to his chest, but his father had a more hands-on approach. Alan Thicke encouraged his Growing Pains co-star Kirk Cameron to take the bull by the horns when Kirk converted to Christianity. Kirk struggled to reconcile his faith with the occasionally controversial requirements of his acting role, but Alan saw a solution. The actor suggested that Kirk take a step back to reassess his priorities, much like his son would do in years to come, following Alan’s tragic and untimely passing. “What I said was, very sincerely, ‘If you’re seriously disturbed by a show like Growing Pains being blue, then I think you’re not going to find a gentler vehicle on network TV for your beliefs,'” Alan shared with Fox News back in 2012. He advised his troubled co-star to take his “wonderful fan base” to Christian broadcasting in order to find peace and avoid future conflict. #Throwback to me, my father and my wonderful son. All these years later, however, the trials and tribulations of life have immobilized the Thicke family once more. In November of 2018, Robin and his family lost their Malibu home to the heavily documented, devastating California wildfires. But the lessons of the past have been fully embraced by the stoic singer-songwriter, who only has eyes for the future.